It's funny how whenever I meet people who aren't from London - be it the North of England, or from outside the UK they always make the assumption that the terrain here must be pan flat. "How are you going to cope with the Peak District climbs of the Polka Dot challenge ?" "It must be really tough for you guys trying to get up Alpe d'Huez when you're from a flat region." Well the answer is, we don't cope any worse than people from other regions and Londoners scale the European cols just as well as the rest of them. You see, London and its 'burbs has alot to offer when it comes to exercising the old quads. Those who say it's flat only hang out in the central area. From Regent's Park head north, and you soon hit Primrose Hill. 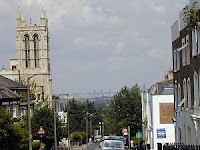 A little further on, you've got Hampstead, Highgate Hill, and the transmitter at Alexandra Palace - right at the top of a steep hill. Moving South to my neck of the woods it's hills galore. Just stepping out of my house and I have a choice of Anerley Hill, Fox Hill, Sylvan Hill before I can get anywhere. There's a 10%, a 13% or a 20%. Take your pick ! Ok so none of them can be described as the Tourmalet, but try doing 10 reps on those beasts at threshold insensity ! Of course once out on the road I would have to negotiate more climbs to get back home again. Down Anerley Hill, through Beckenham, West Wickham, Keston, Biggin Hill, Westerham, Edenbridge, Hever Castle, Cowden, Penshurst, Chiddingstone, Four Elms, Brasted, Pilgrims Way, Titsey, Beddlestead, West Wickam, and back home. It's a 60mile loop that takes in a number of hills : Saltbox, Hosey, Yorks, Toys, Titsey, Hesiers, Corkscrew, Anerley. The mileage is ok, but with the hills thrown in this makes for a real work-out. Riding it a few weeks ago on the one hot summer's day we've had this year, with Stanley was pretty hard work. Especially as he was a real mountain goat dancing up the hills on his lightest road bike while I struggled along on my heavy training bike. 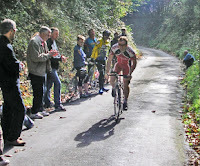 Riding up the brutal 20% on White Lane (the course for the Bec Hill climb) I almost passed out ! By the time I got back to Anerley Hill I was wasted. So really, we have nothing to worry about when it comes to finding hills. Our biggest worry is in knowing which one to choose and summoning the courage to climb it !